Along with a few other notable players, such as Malcolm Mitchell and Ron Ninkovich, one of the biggest offseason additions of the Patriots returned to practice in full pads this week. 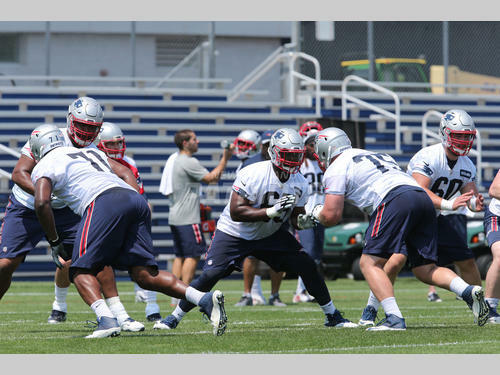 Offensive lineman Jonathan Cooper, who New England acquired in the Chandler Jones trade, went down with an apparent leg injury about two weeks ago, and collectively as a whole, the entirety of Patriots Nation rolled their eyes and groaned. It's not that it was another injury, but Cooper was known for his injury riddled seasons even before he arrived at Gillette. However, he's back now, and the fact that he's practicing in full pads and with contact, bodes well for his status regarding the beginning of the regular season. And with Sebastian Vollmer on IR and Shaq Mason still mending his broken hand, the Pats need all the help they can get up front.